A baby grows very fast, it isn’t a secret. One day you are holding him/her gently in your arms and the next he/she is squirming to be free and discover the world around. When your kid begins to develop an interest in the surroundings and especially toys, it is vital to encourage that interest with stuff that allows him/her to learn and grow, as well as have fun. The early stages of crawling and walking are no exemption. 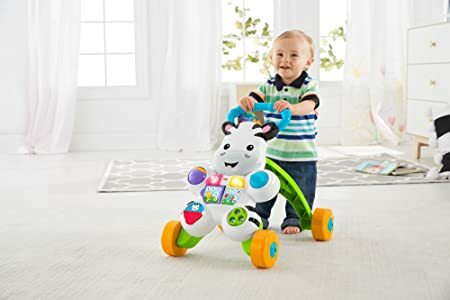 You may want to assist your child grow his/her walking skills and explore from the time he/she stand upright, so you may want to conduct some research and select the best baby push walker in the stores in order to develop and nurture that new skill. The following buying guide will help you get started. Let’s begin with the benefits of a push walker. This is the first time your kid is beginning to have the notion of movement. At this stage, you may consider supporting your kid by providing a push walker toy. It aids to assist them develop their motor skills and provides them with a sense of coordination and movement. The more help your baby get from these products, the faster he/she will generate his/her motor skills and thus begin to walk. We all want our babies to be imaginative and curious. There is no better way to stimulate this imagination than via these toys. They help to establish your baby’s skills, such as lifting one leg while balancing on the other, and self-esteem. The Majority of modern day walkers come with built-in accessories and toys that help your child to play and learn new things. They help kids to rejuvenate their mind. These are just some of the major benefits of having a walker. Next, we will look at the qualities of a good walker. Stability is important to a great push walker. You want your walker to be steady so that your kid doesn’t go through misfortunes during his/her first stages of walking. You need to ensure that the base of the product is heavy and steady. This ensures that the center of gravity is close to the surface and doesn’t tip while walking. Consider a walker that has a wide width, as this also aids stability. Narrow gadgets have the tendency of tipping and falling which can be risky for your kid. Ensure that you buy a product that has sufficient traction on its wheels as this helps your kid to walk better. Additionally, it is best if the wheels can be loosened and tightened depending on how your child walks and his/her age. A higher base facilitates a beginner to lift himself/herself easily when compared to a lower one. Get a product that is made from natural substances such as wood. However, plastic materials aren’t harmful and most walkers are made using them because they are considered to be safer and lighter. Again, natural materials are better because they cannot harm kids when they chew them. In addition to things to consider when buying a baby walker, which we will look below, qualities of a good walker will help you choose only the best product one the market. A walker that is versatile may change into a baby jumper or bouncer, a stationary activity center or a rocker to keep your child busy and provide him/her more play time. The price of push walkers is a major thing that parents should consider before they buy them. You should have a budget before you decide to shop for the walker. If you want a product that features different things (bells, toys, whistles, lights, etc) then you might want to have more cash for the walker. Alternatively, you may try the basic models – they don’t have most additional features but they are quite cheap. You will want to ensure that your kid is comfortable with the walker so that he/she can play with it. Go for models that are easy to adjust and have cup holders as well as snack trays so your child can enjoy a bite while on the move. Like all other baby products, it is important to make sure that the walker you buy is protected with a warranty so that you can get a refund or get it replaced if it is faulty or gets damaged. Ensure that you read the warranty for the push walker model you want to purchase. Before anything, check out the safety characteristics of the push walker. Does it have a strong or wide base to prevent your child from toppling over? Does it have anti-slip pads? Can you change the speed settings? You will want to have all these features when purchasing a good walker. Amusements are incorporated to entertain your kid. You will want to have some form of amusements attached to your baby’s walker such as colorful toys and musical mobiles to play with. Your goal is to ensure that your walker has as many features as possible but be within your budget. Before we review the top five walkers on the market today, let clear the following controversy about these products. Does a Baby Push Walker Payoff? They are perfect for gross motor skill – they provide support for kids who can’t quite walk or stand on their own. Pushing a walker helps build confidence, balance, and strength – 3 essential elements to become a champion walker. They stimulate your kid’s imagination – Playing with push walkers that resemble real-life apparatus encourage children to enter the real world of fantasy fun. Plus, baby walkers help increase self-esteem as children move around as you perform your daily chores. They pull double-duty – The best baby push walker has other toys built in. For example, some walkers come with shape sorters, a complete activity center, or blocks. In addition, they often last long, both in terms of sturdiness and play value. The bottom line: Baby push walkers are great products that you should consider getting for your little one. From small to big steps the VTech Sit-to-Stand Learning Walker helps your kid to develop from a novice crawler to a professional walker via adaptive technology. With a hundred of playful pals to cheer the baby, your kid will have a lot of fun as he/she learn to walk. Begin with the removable activity section for surface play or on-the-go fun, then, increase the fun with the fun-to-navigate walker. 5 piano keys, 3 light-up buttons, 3 colorful rollers, 3 light-up shape sorters, a telephone handset, and spinning gears provides endless fun that will inspire your kid’s to learn and develop his/her motor skills. This walker keeps children on track teaching animals, colors, music, shapes, and more. 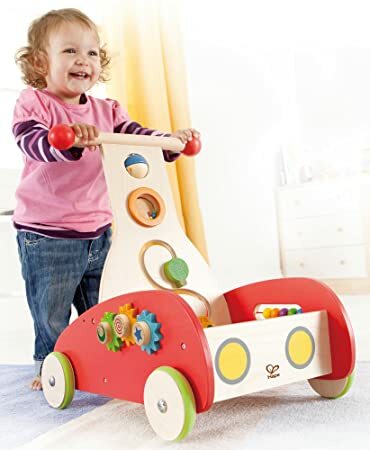 This baby push walker is part of a wide large of toys developed to develop with your baby. Install panels to your walker as your kid grow and he/she will continue to have fun and learn as he/she gets older. With 2 modes of play, learning and playing music on the activity panel will keep your baby engaged while he/she develops. You only need to add the shape sorters or just press the 3 shape buttons to learn shapes. Your kid will enjoy spinning the 3 flowers to hear fun words, sound effects, as well as a melody or playing the piano keys to learn animal sounds, numbers, and colors. With the music mode, press the 3 shapes buttons or insert the shape sorters to hear fun sound effects and upbeat melodies. Your kid may also press the piano keys to listen to its notes. When a melody is continuing to play, your baby may press the piano key to activate fun animal effects and sounds on top of the melody. The walker has an adaptive technology that helps babies develop from crawlers to walkers. Your baby motor skills develop with its colorful spinning rollers, shape sorters, and light-up buttons. The activity panel is easy to assemble and remove so your baby is able to carry it around or have some surface playtime. Your baby will not only play but also learn. Wheels are installed with rubber seam to avoid sliding on a smooth surface. Come with 2 setting on the wheel to control the speed. Some people don’t like its sounds. Others don’t like the fact that it plays music continuously. Get ready to have fun! With one of the best-selling walkers on the market today from Hape toys, your baby will be ready to learn and walk. Setback wheels offer a sturdy base for children to lift themselves up, and the special design makes pushing easy while encouraging small steps. 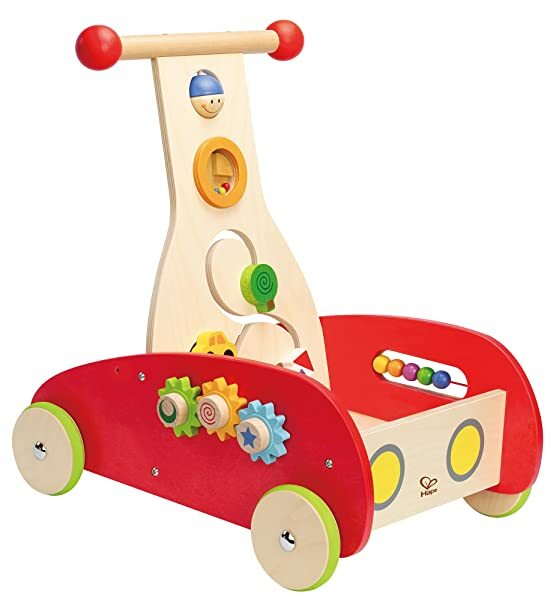 Colorful balls and moveable gears and knobs turn the walker into a busy play-area on wheels. The rubber lining on the wheels ensure that the push walker doesn’t slide, while the storage area provide room for pals to come along and enjoy the ride. It only takes 15 minutes to assemble the walker and your baby will be ready to discover the world and have fun. The product is finished with durable child-safe paint and solid wood construction which make it safe for children. The wood are environmentally friendly and the walker stimulate kids through all stages of development and aid nurture and develop their gifts or abilities. With this product, your kid will gain confidence as he/she explores the world around. It is also perfect to pull and push and bring along objects – is a thoughtfully designed push/pull walker which is suited to your kid’s favorite activities. Hape walkers and other toys are designed for kids. Every product is developed to improve your baby’s developmental skills. The firm believes that the future belongs and begins with the children. Therefore, they have made it their duty to leave them with endless possibilities, not complex issues. Their toys, including Push and Pull Walker are made to inspire learning, play, and explore the world. This walker is one of the best products on the market today, I bought it for my little boy and it haven’t disappointed. It is made of Solid wooden construction. Have a lot of gears and turning knobs. Boasts of many brings colors. It is perfect for developing coordination as well as other motor skills. Come installed with rubber-trimmed wheels that protect the floor and control the speed. It is made from non-toxic finish using harvested materials. Designed to teach first phrases to encourage your baby to take the first steps, the Fisher-Price walker is the type of first pal you want your kid to have. Spin it, flip it, roll it, click it, twist it! This product is full of busy, hands-on games for sitting and walking babies. Your kid may turn the book page or even press the light buttons to learn all the ABC’s and 123’s via sing-along phrases and songs with new animal pals. As if that isn’t enough, when your child is learning to walk, the simple-grasp handle and firm four-wheel base help steady those shaky first steps. Keep walking! Lots of fun words, songs, and music invite as well as reward even more grooving and moving to help your baby get even steadier on his/her feet – you will breathe easier. The zebra has really earned its stripes for assisting kids’ development. You probably won’t get a better first pal for your boy or girl than this walker. Sitting kids will love different hands-on tasks: a switch to flip, light-up buttons to push, a roller ball to spin, a page to turn for learning songs and phrases, a dial to twist, and even a pal to play with. And when your kid is ready to stand up and walk, the zebra steadies first steps and walking with encouraging fun music and phrases. This is truly a friend for your baby to develop with. Four-wheel base aid your little one to balance better and ensure that the first steps are less wobbly. This walker also helps foster coordination and balance, and provides gross motor skills. It also give your child important sense such as hearing and sight a big boost. This product is great for all-round development of children. As one of the best baby push walkers on the market today, Spoon combines two kid essentials into one: high chair and walker. 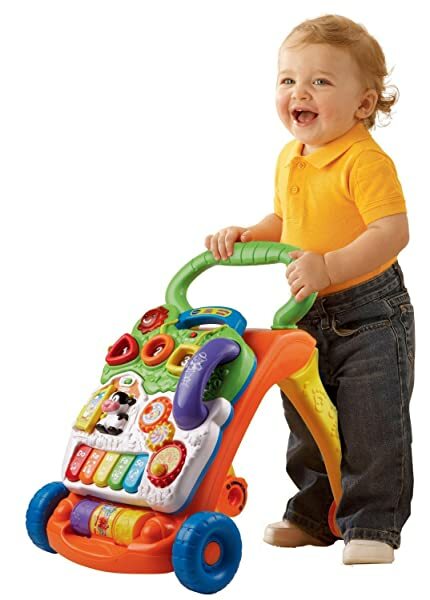 This zippy small walker offers the perfect balance for learning to walk, playing and eating. Good-looking and practical, the push walker will fit into all rooms in your residence. For snack and meal time, the walker has a large tray with a detachable dishwasher. For playtime, there is plenty of clean area for all your baby’s favorite toys. The high gloss finish and bright white color give the Spoon Walker premium design that clean up easily and appear great. As your kid learns to develop walking, you will feel assured using this walker due to its wide base that offers unmatched stability, safety, mobility, and strength. The base ensures that your baby’s fingers don’t get pinched on the surface or side of the tray if your kid bumps into a structure. Its seat pad is comfortable and supportive, easy to wash, and is made with quality materials (600D) combining soft and padded seat back with luggage grade toughness. The walker has 3 heights positions to choose from that are ideal for a kid who can sit well, 33.5 inches tall, and/or up to 30lbs. It is built with strong steel, non-slip stair pads, and oversized wheels to meets all the standards of safety. Joovy recommends using a barrier to keep the stairs out of children’s reach. The Spoon walker folds flat for easy travel and storage. It also comes when it is 90 percent ready for use, you don’t need to do much to make it ready (just install the seat pad). The product is entirely PVC, Phthalate, and BPA free. It is also certified. My sister bought this product for her 9month old daughter and she has been having fun since. 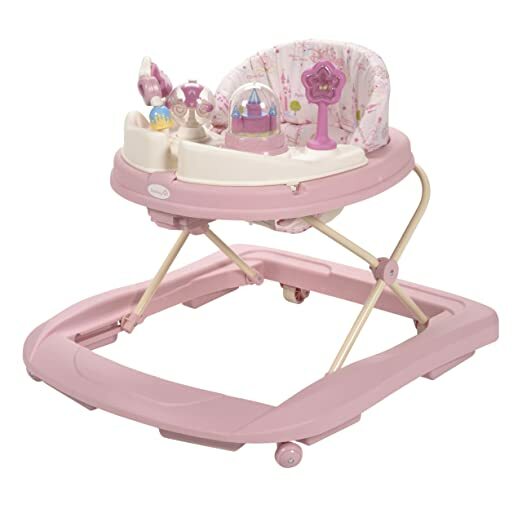 The Disney music and lights walker provide a lot of fun for your baby. Its study wheels work perfectly on carpet and floors alike, while its grip strips control walker movement on rough surfaces. 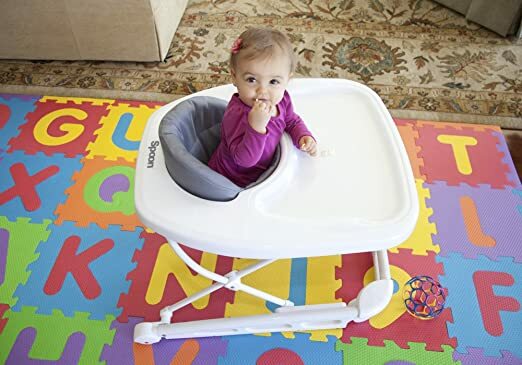 The big play tray contains all the Disney characters your baby loves and easily swings open to show a snack tray ideal for children treats as well as other toys. With an easy to clean padded seat (also machine-washable), cleaning your walker has never been this easy. What can we really say about Disney items other than that babies love them? So is the music and lights walker that provide a cute Disney-themed play center sure to attract the young and the old. The walker also adjusts to three different height settings that are perfect for a growing kid. This pink walker will surely be loved by your little queen. The walker is very easy to assemble; there is a way to attach the tray to the top of the walker which is to ensure that the plastic part that attaches to the pink part doesn’t get caught – it is easier done that said. The walker also comes with 4 toys that attach to the top; the castle one that sings the song and lights up red do require double A batteries. My neighbor bought this walker and say that she love that she can open up the toy tray to remove the snack tray without having to remove toy one – you only pull the small tabs on the base to remove the trays. The walker might be a little hard to lower and raise but I think they precisely made the button hard to push in to ensure that it doesn’t accidentally drop down when your kid is using it. If you are searching for options on the best baby push walker on the market today, you have acquired enough knowledge from the above information. With different options to select from, I have little doubt that you will soon get the perfect one for your little one. Do you want a product with a busy task center? Or you want one with minimal effects, but a lot of space to add your items or toys? You will get them. The VTech Sit-to-Stand Learning Walker would be a great choice for all the parents out there; it gives the best opportunity for your child to play and develop his/her motor skills. 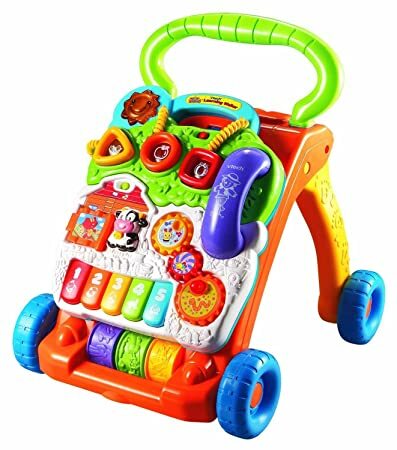 Its features such as 5 piano keys, 3 light-up buttons, 3 colorful rollers, 3 light-up shape sorters, a telephone handset, and spinning gears are also great for children of all ages. Ensure that your child gets only the best that the market can offer. Have fun with a push walker!